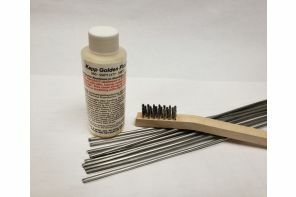 Kit contains: 10 – 18” long x 3/32” (2.4mm) diameter rods, a Stainless Steel brush for surface preparation, 2 oz. of Kapp Golden Flux™, and complete instructions. Kit contains: 10 – 18” long x 1/8” (3.2mm) diameter rods, a Stainless Steel brush for surface preparation, 2 oz. of Kapp Golden Flux™, and complete instructions. Kit contains: 20 – 18” long x 3/32” (2.4mm) diameter rods, a Stainless Steel brush for surface preparation, 2 oz. of Kapp Golden Flux™, and complete instructions. Kit contains: 20 – 18” long x 1/8” (3.2mm) diameter rods, a Stainless Steel brush for surface preparation, 2 oz. of Kapp Golden Flux™, and complete instructions. 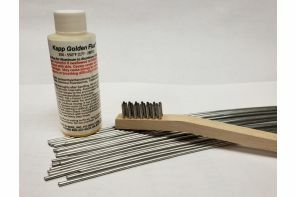 KappRad™ is a Tin-Zinc-Cadmium multipurpose solder developed specifically to join and repair Aluminum and Aluminum/Copper radiators as well as heat exchangers. Its lower melting point makes delicate repair work easier. KappRad™ forms very strong joints on most metals, including Aluminum, Stainless Steel, White Metal, Pewter, Copper, Brass, and Galvanized Steel. In addition, it can be plated with Chrome, Nickel, or Copper. In most cases, the repair is stronger than the original metal. This alloy is NOT recommended for food or potable water applications. Please see KappFree™ and/or KappZapp™ for Food Save and Potable Water Applications.